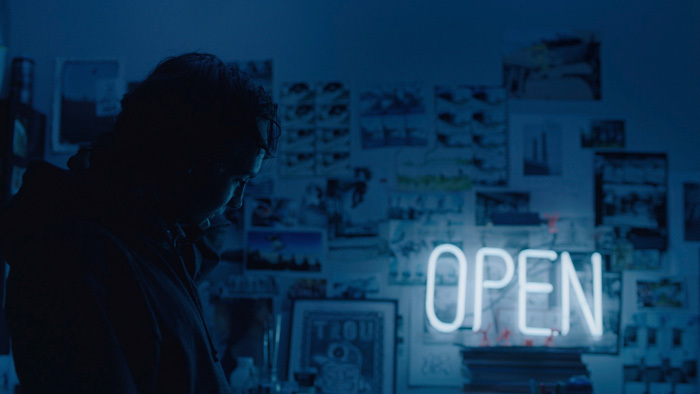 Writer/director Patrice Laliberté‘s short film Overpass relies heavily on our suppositions as the viewer. And it does so to perfection. To us Mathieu (Téo Vachon Sincennes) has done nothing to earn the benefit of the doubt. Not only do we meet him sneaking out to illegally spray paint a bridge over the nearby interstate, he’s willfully difficult with his parents as a rule at home. He smiles when he escapes imprisonment and projects can’t-be-bother frustration when his mom (Sandrine Bisson) asks him to simply close cabinet doors once he’s done getting what he wants. Mathieu is the consummate seventeen-year old troublemaker defacing property and smoking weed—a lost cause. We’re not supposed to sympathize with him; we sympathize with those he lets down. His avoiding Dad (Stéphane Jacques) is probably the result of the latest thing he’s done wrong and his mother asking for him to return home by 3:30pm so he can travel to the airport for his brother’s arrival virtually assures a fresh example of disappointment positioned on the horizon. This is the environment Laliberté introduces: a nice up-standing family with an unreliable black sheep always one step away from ruining his life and theirs in the process. And for what? To paint some lewd remark the city can laugh at on their morning commute? You almost wish Mathieu’s mother would have told him to stay with his skateboarding friends and just skip the airport altogether. She can’t be let down if there are no expectations. Overpass is not that easy, though. Surfaces are deceiving—to a point. Mathieu is obviously a delinquent, but perhaps he isn’t so out of touch with the emotional gravity of the situation his family finds itself in the midst of enduring. Laliberté somehow pulls his strings so that we think the worst of his lead character, but we never see his fingerprints until the end. The journey is natural and authentic from the long take opening of Sincennes walking with plank and paint in hand down the street to the meaningless chatter about chicken fingers enjoyed by his stoner crew. The boy’s ambivalence and juvenile sense of resentment are so relatable to our own youthful experiences that we can’t tell they’re actually hiding grief. What’s at once a neo-realist account of a punk kid wreaking havoc turns on a dime to a heart-breaking look at loss and how we all cope in our own personal ways. Whether it’s taking our minds off what’s coming by cleaning the house, silently working away in the yard so as to not breakdown when melancholic thoughts interrupt idleness, or utilizing a creative outlet to pay tribute to the fallen—nothing strips us down to naked emotion and thusly catalyze an attempt to camouflage like death. In this manner everything Laliberté supplies is smoke and mirrors and boy does a few seconds of Jacques in the rearview mirror reveal the stunningly poignant truth. Life is full of surprises from the unlikeliest of places. 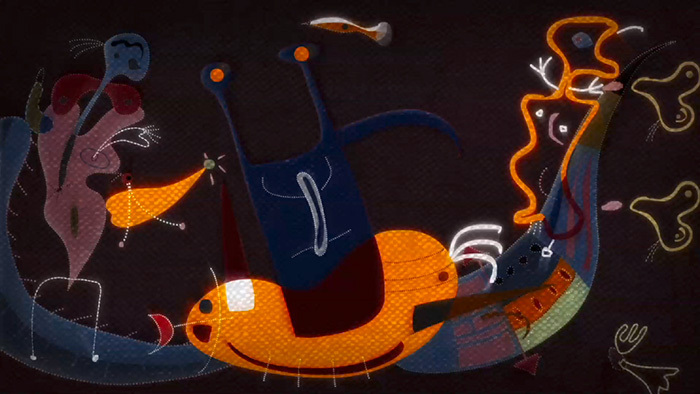 Animator Theodore Ushev embraces yet another visual style to treat us with at the Toronto International Film Festival. From conté crayon images rotoscoped atop Jafar Panahi in 2012’s Joda to the Cubist/Constructivist homage of 2013’s Gloria Victoria, his latest The Sleepwalker delves into Abstract Expressionism bearing to mind an amalgam of Arshile Gorky’s painting and Alexander Calder‘s mobile sculptures. It’s all geometric shapes, mostly with curved edges, each dotted as though fabric sewn with seams collaged and brought to life in a gyratory dance to Kottarashky‘s infectious Balkan beats. Oh, there’s a bit of Federico García Lorca‘s poem “Romance Sonámbulo” too. It starts with the last line of the first stanza “Under the gypsy moon, all things are watching her and she cannot see them” before the biomorphic shape of a woman on her balcony looks out onto a world peering back. She folds into the black void of the frame shortly after as the repetition of figures pulsing and flowing together or in sequence, multiplying and moving to the music, mimics the cyclical nature of the poem. Some forms resemble discernable objects from life and others are closer to cellular organisms floating around invisible to the human eye. And just when we think it’s merely a fun music video, the woman returns in a different form—metaphorically there watching, but forever blind to see. Despite many aging punk rockers going strong—or maybe they’re the punk poppers—the punk-rock game is for the young. It’s easy to be anti-establishment and anarchist when life has yet to drag you into its tractor beam of responsibility. To party all night and not worry about the consequences an evening in jail brings isn’t something you can sustain into your late-twenties when life replaces fun. Noa (Michal Korman) understands this because she finds herself at a crossroads between following love for love’s sake or contextualizing her next step with what she desires for herself. Orr (Agam Schuster) knows what will bring her personal satisfaction and the fact she’s willing to leave Israel for Berlin to find it without her girlfriend says volumes. But maybe all Noa really wants is Orr. Maybe following her is enough. This is their One Last Night, a hopeful evening of fun and romance to hold them over until Noa can join Orr at year’s end. Whereas the latter’s excited about what the next day holds, the former can’t help feel pained. It alters her sexuality in bed and prevents her from seeing anything around her except the want to spend as much time together as possible. So when they finally agree to leave their local bar for home, Noa is desperate for Orr to ignore an acquaintance named Dima being harassed by the police. Nothing good can come of an altercation and she knows Orr’s interference will merely press pause on the inevitability of this troubled friend’s incarceration. But ignoring isn’t what Orr does—she runs headfirst and worries about the fallout later. Written and directed by Kerem Blumberg, this short depicts the compromises we’re willing to make to achieve our goals. Whereas Orr seeks to stand up against a government for what she construes as wrongdoing—enough to leave town for good—Noa strives to stand up for the person she loves no matter the damage to others. Whether one is more just than the other is up to you to decide as there’s a case for Orr going home with Noa to move on with their lives as well as one for her to stay true to who she is without backing down. Where things get blurred is when one begins to make the other’s decision for her. The takeaway being that selflessness will always be motivated by selfishness. The question is whether you’re able to accept that realization.